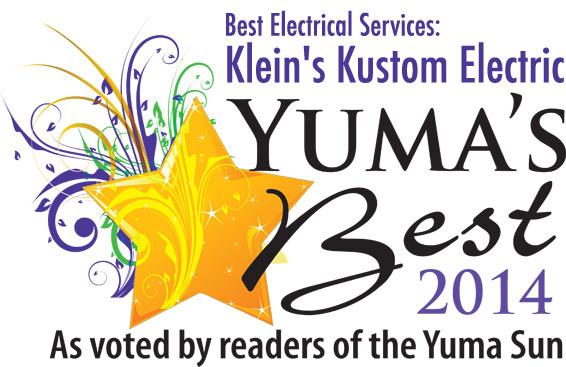 Yuma AZ Electrician & Yuma AZ Commercial Construction by Klein's Kustom Electric Inc.
We are a licensed electrical contracting company that has expertise in commercial building along with commercial and residential service work. Serving you effectively is our top priority. Klein's Kustom Electric was established in 1968 by Jerry and Millie Klein. In 1998 Keith and Kelly Boyd purchased the business and continued the tradition of providing high quality service at a fair price. We believe in operating our business utilizing Rotary's 4-Way Test ensuring fairness to all concerned. For nearly 50 years, Klein's Kustom Electric, Inc. has been an integral part of some of Yuma's most challenging and extensive construction projects. In addition, the company has an excellent service department that is second to none in its reputation of quality work and dependability. Klein's Kustom Electric is staffed by professionals who have been part of our team for many years. Dedication to the Yuma community, along with good old fashioned work ethic, makes Klein's Electric employees a team that operates with unsurpassed efficiency and quality workmanship.